NOTE! The POWER UNIT for this saw weighs 330 lbs! Power unit measures; HEIGHT:29.5"; WIDTH:23"; LENGTH:36"
Package consists of the P95 18HP Hydraulic Power Unit, 814PRO Hydraulic Saw, 13-Inch Guide Bar, 25' of Hydraulic Hose, and Diamond Chain. In addition to the Package charges, the Diamond Chain is charged on a portion used basis. P95 Hydraulic Power Unit: Adjustable Flow 5 to 8 gpm; 2000 psi operating pressure, Auto Throttle & Electric Start. 814PRO Hydraulic Saw is 8 gpm. Can cut approx. 1" parallel to a wall. 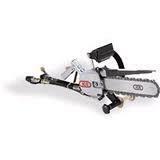 * Please call us for any questions on our saw hydraulic concrete 12.4 inch chainsaw rentals in Tualatin and Eugene, serving the Portland Metro area, Eugene/Springfield Metro area, Oregon, and SW Washington.